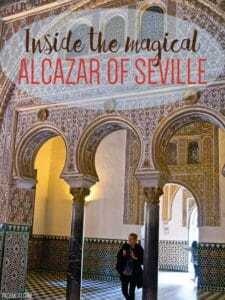 When you go to Seville, everyone tells you to visit the Alcázar of Seville (Reales Alcázares de Sevilla), the royal palace originally built by Moorish Muslim kings. Today, it is used by the royal family as their official residence in Seville making it the oldest royal palace still in use in Europe. After visiting this UNESCO World Heritage Site, I can see why everyone raves about it. It’s absolutely stunning! 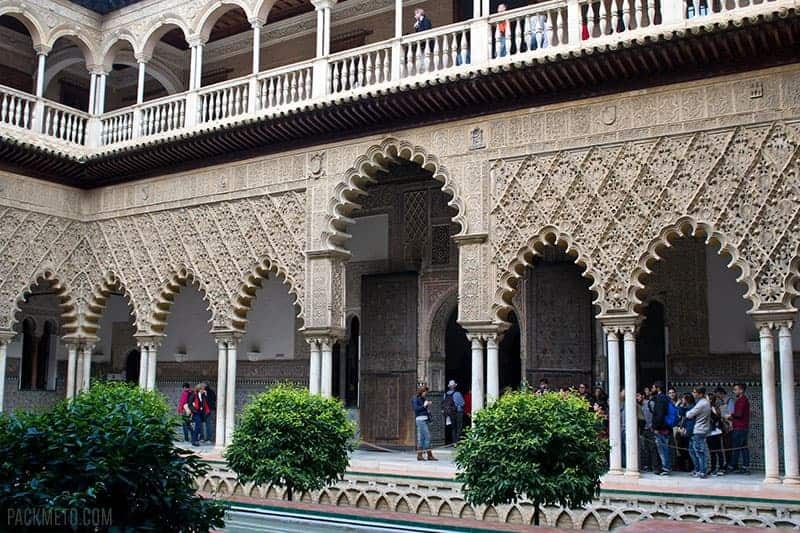 The Alcázar is lauded for being an outstanding example of mudéjar architecture (a style of Spanish architecture from the 13th to 16th centuries fusing Romanesque and Gothic styles with Arabic) found on the Iberian Peninsula. And I can understand why. As I wandered from room to room, I was so overwhelmed by the beauty and the intricate detailing that went into building the palace. Here are a few of my highlights from my explorations of the palace. 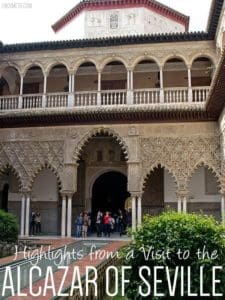 One of the first areas we visited, the Courtyard of the Maidens (Patio de las Doncellas) was a stunning introduction to the beauty of the Alcázar. At the centre, surrounded by sunken gardens, is a reflecting pool running the length of the courtyard. Around the courtyard are intricately decorated pillars and arches. The detailing was delicate and felt just feminine to me. A fitting name for the courtyard I felt. However, its aesthetics is not how the courtyard got its name. 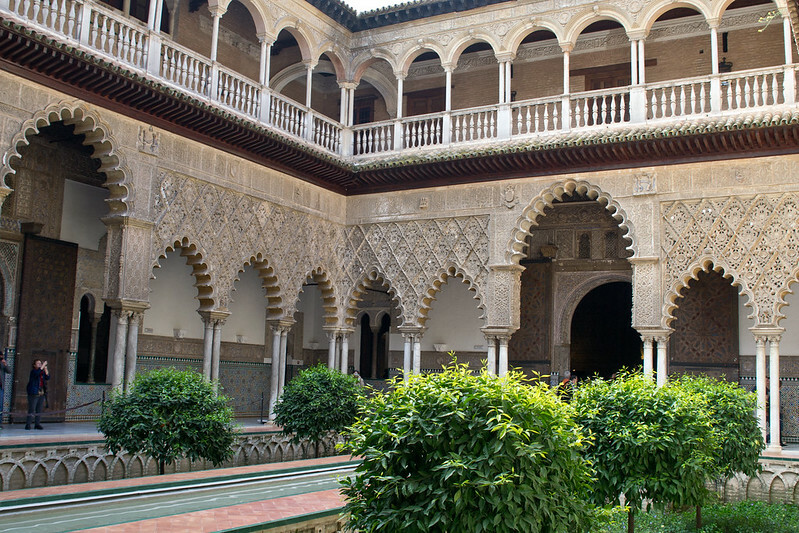 The courtyard is actually named after a legend in which Christian kingdoms of Iberia were required to supply 100 virgins every year to the Moors. Surprisingly, the sunken garden was only a recent discovery. It was excavated in 2005. Previously, it was covered by a marble covering and Renaissance fountain dating back to the 16th century (see a photo). Incredible that we’re still finding discoveries as recently as 11 years ago! 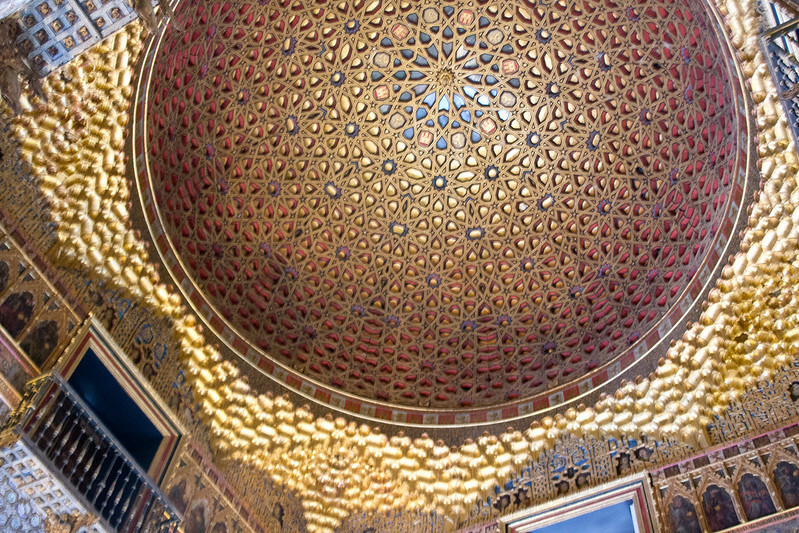 Another room I absolutely could not get enough of was the Hall of Ambassadors (Salón de Embajadores), also known as the throne room, with its beautiful dome ceiling. Carved from wood and gilded in gold, it looms high above you. 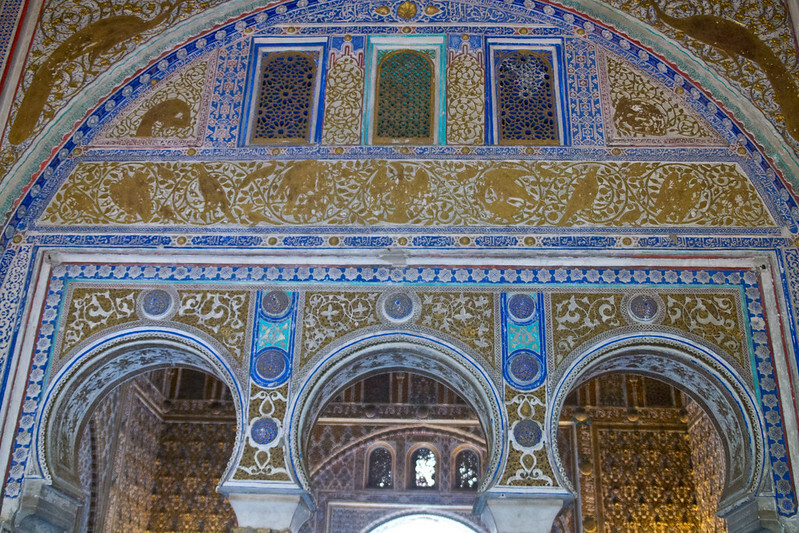 Leading into the room are archways decorated with golden carvings and geometrical patterns. 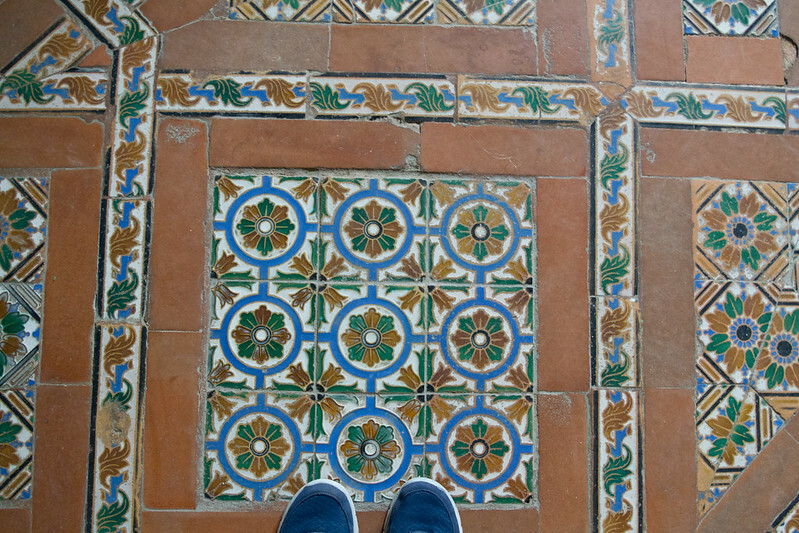 Its walls are tiled with blue and green in a variety of patterns so intricate and gorgeous, you almost feel like you could get lost. 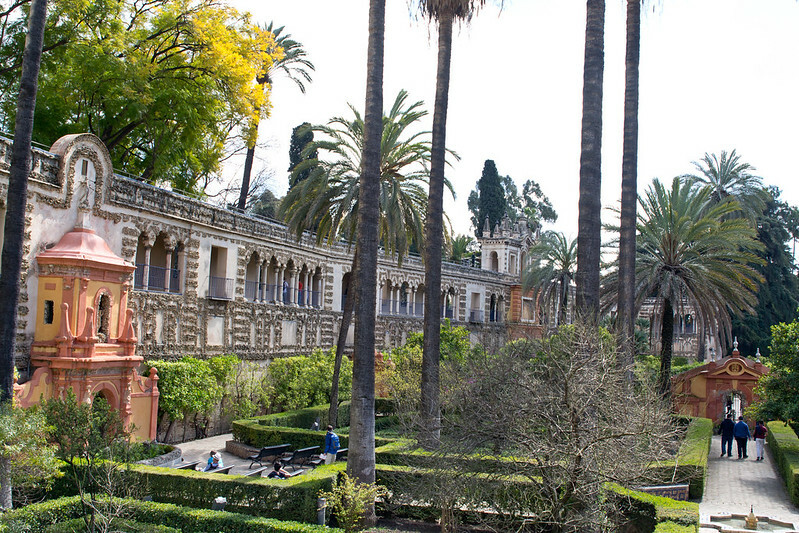 Surrounding the Alcázar are its extensive gardens filling your nose with the scent of orange, a common smell in the spring in Seville. I could almost pretend that I was royalty, out for a wander to enjoy the sun. 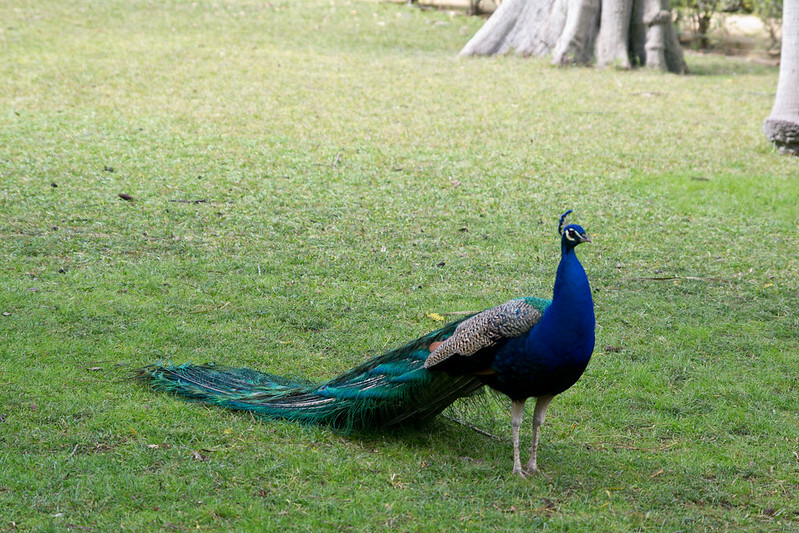 Of course, I would have a peacock wandering the grounds and a fantastic fountain to sit by. And if the sun was too overbearing, a walk through the covered gallery that cuts through the gardens would be perfect. Alas, it was a touch too busy in the gardens to fully fall into my daydream. 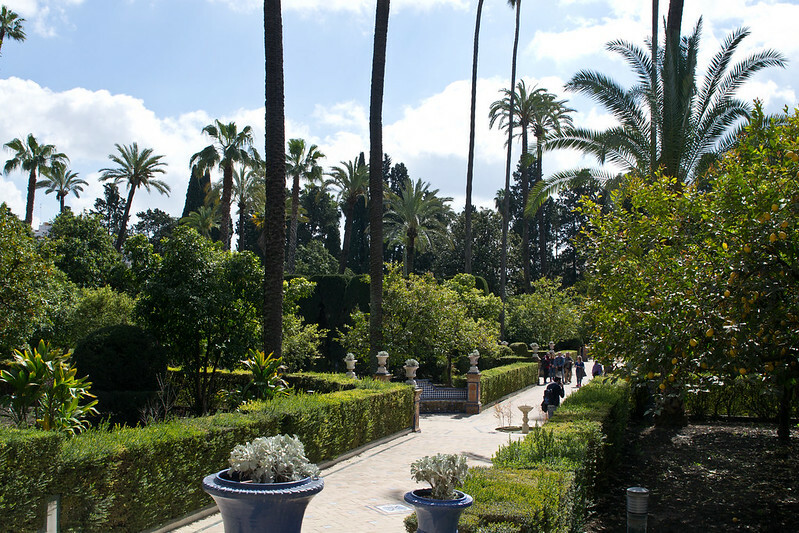 The gardens are divided into different areas depending on their unique style. 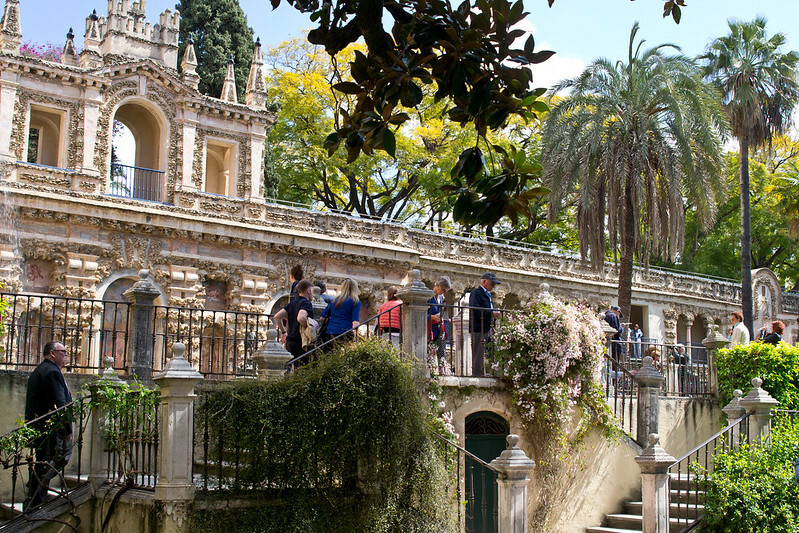 Be sure to look for the little doorway that grants you access to the aforementioned Grotto Gallery (Galeria de Grutesco) overlooking the garden. Another not to miss hidden area is the underground bath (Los Baños de Doña María de Padilla), a short reprieve from the Spanish heat, hidden under a building with an entrance off of a garden. There is also a maze on the grounds which were unfortunately closed during our visit. In a word, yes. I’ve only highlighted my favourite rooms and areas of the Alcázar, but there are plenty of other stunning places to see in the buildings. You’ll just have to go and see for yourself. Especially if, like us, you are not visiting some of the other Moorish cities in Andalucia. For a moment, it feels like you’ve left Spain and landed in Morocco and Northern Africa. It is a very cool juxtaposition of cultures and architectural style. The whole grounds and buildings of the Alcázar are otherworldly and I can understand why the Game of Thrones series chose to use it as a set for Season 5 of the series. 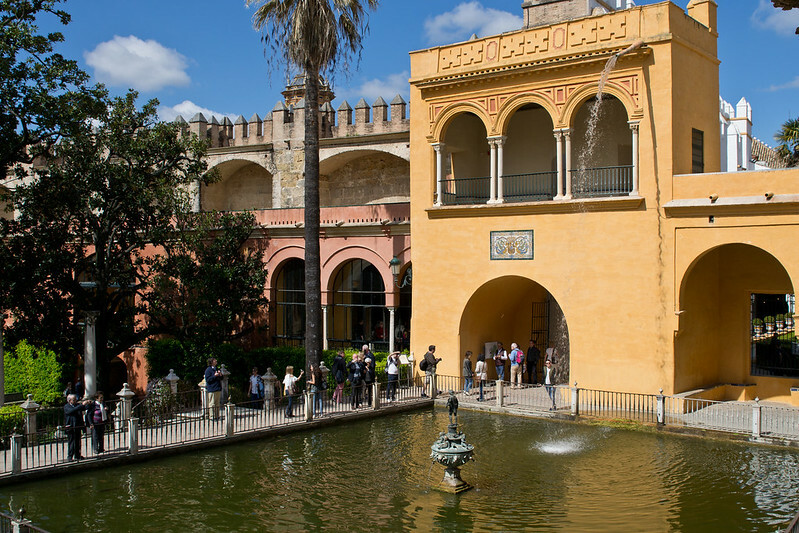 For a good breakdown of the different scenes filmed at the Alcázar, check out this link. It has also been used for movies including Lawrence of Arabia and the Kingdom of Heaven. 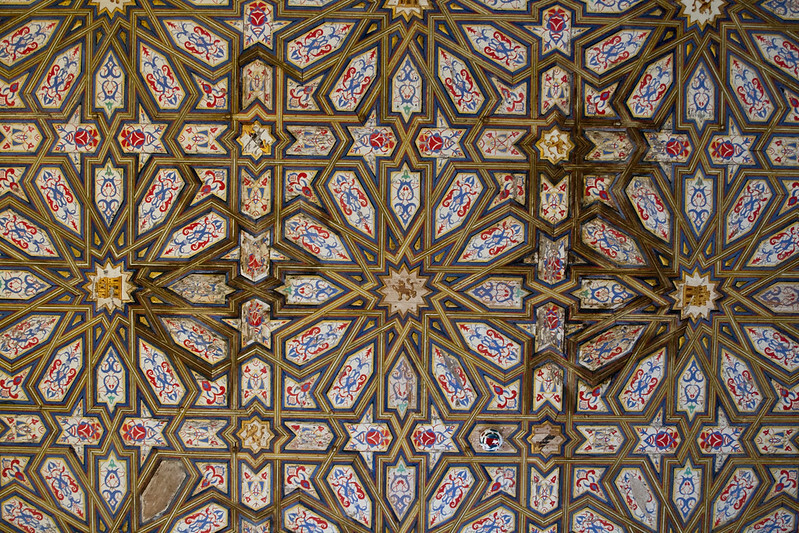 Do yourself a favour when in Seville and make a point to go inside the Alcázar. 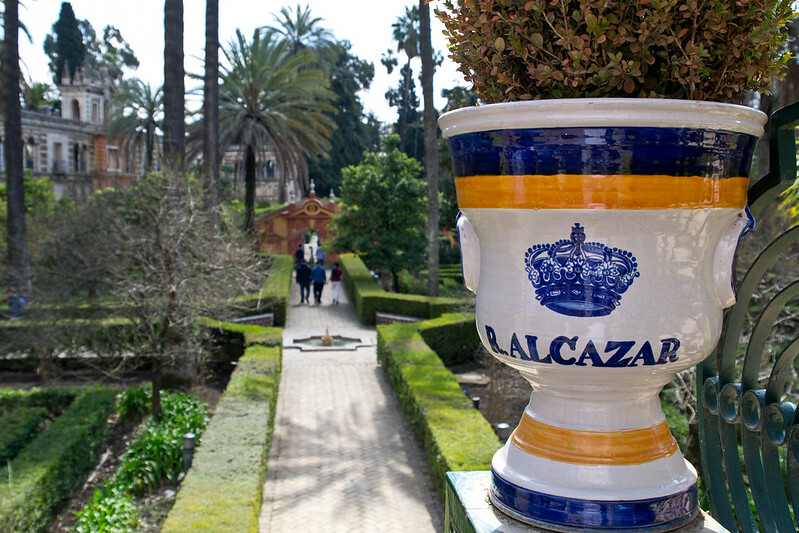 Have you been to the Alcázar? Were you wowed like I was? 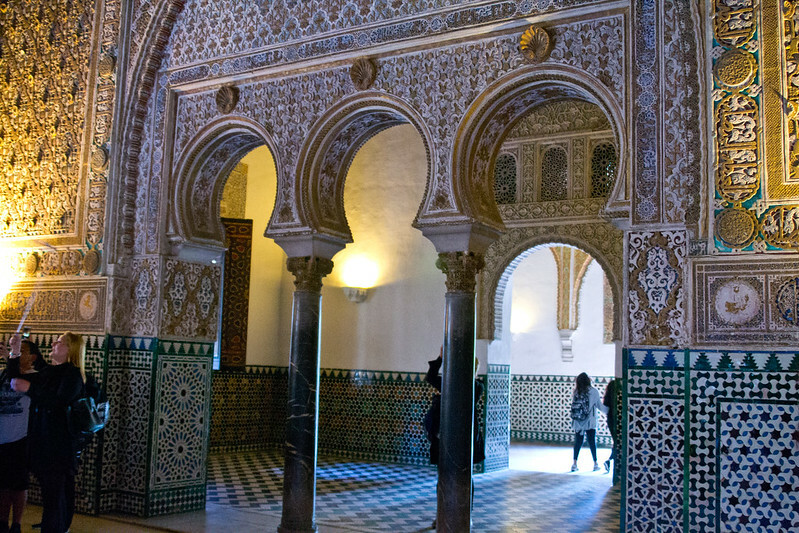 Have you been to some of the other Moorish palaces in the area? 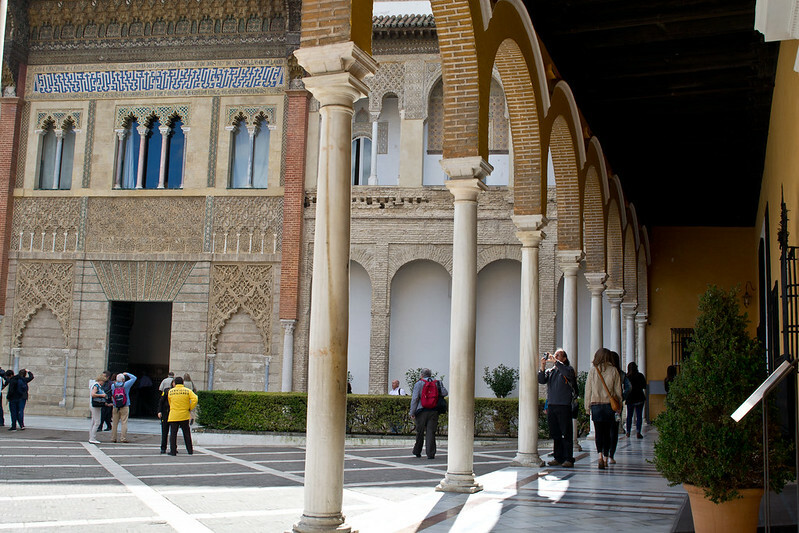 The entrance to the Alcázar is through the Lion Gate which faces the Seville Cathedral. 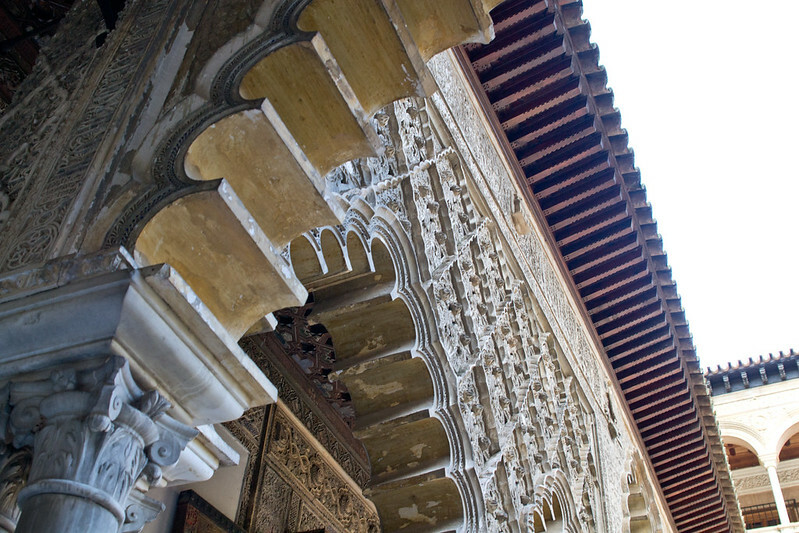 It’s easily accessible on foot from anywhere within the Seville city centre. 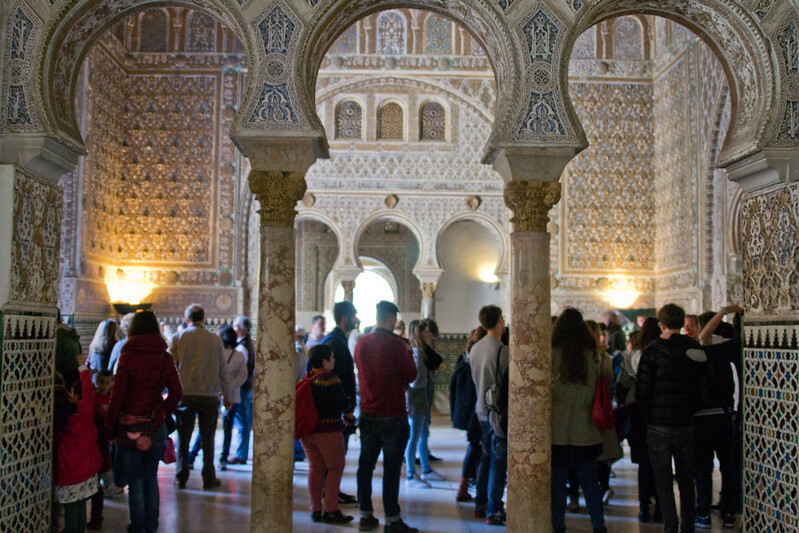 It can get quite busy inside the Alcázar. Our free walking tour guide recommended going during siesta time. We went shortly after opening and there were quite a number of people and school groups visiting. There is a maximum of 750 people who can visit at once and once that is reached they won’t let more people in until some have left. There are a number of buildings to wander through and the garden grounds are extensive. 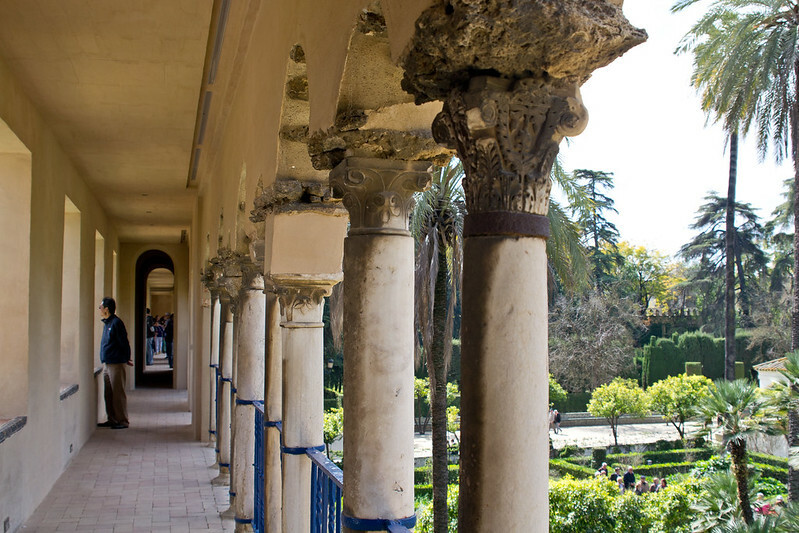 Allow yourself two or three hours to fully experience the Alcázar. We were there for just over 2 hours. Be sure to pick up a map from the entrance area to ensure you don’t miss any areas. 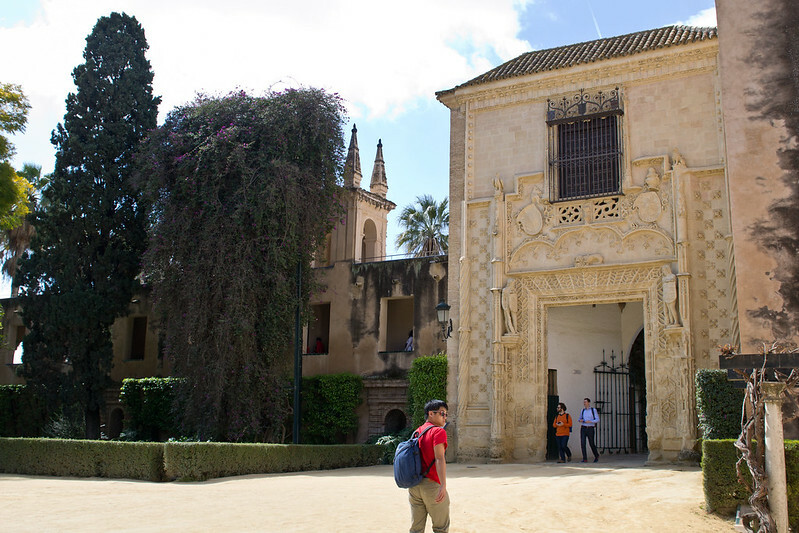 The royal apartments, where the royal family lives when they’re in Seville, can be visited when they’re not in use. Look for the ticket desk outside the Admiral’s Hall (Salón del Almirante). Seville is so beautiful! Spain is my first choice for my first solo adventure! 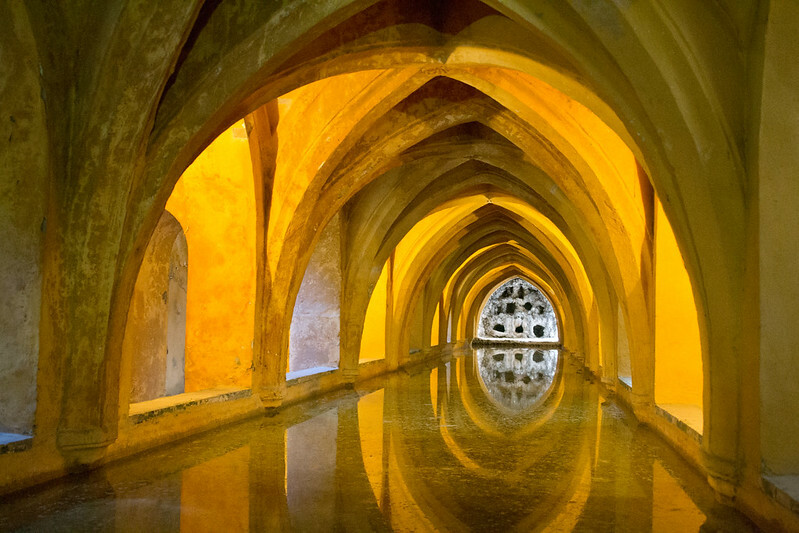 We were in Seville last summer and visited the Alcazar, but looks likes we missed a few spots like the underground bath. Beautiful details captured in this post! Having studied built environment as part of my Heritage Degree everything about architecture fascinates me. You took some amazing photos and highlighted the beauty of the palace well. I love the fusion of Romanesque, Gothic and Arabic styles and looking at the Hall of Ambassadors, I forgot you were in Spain. 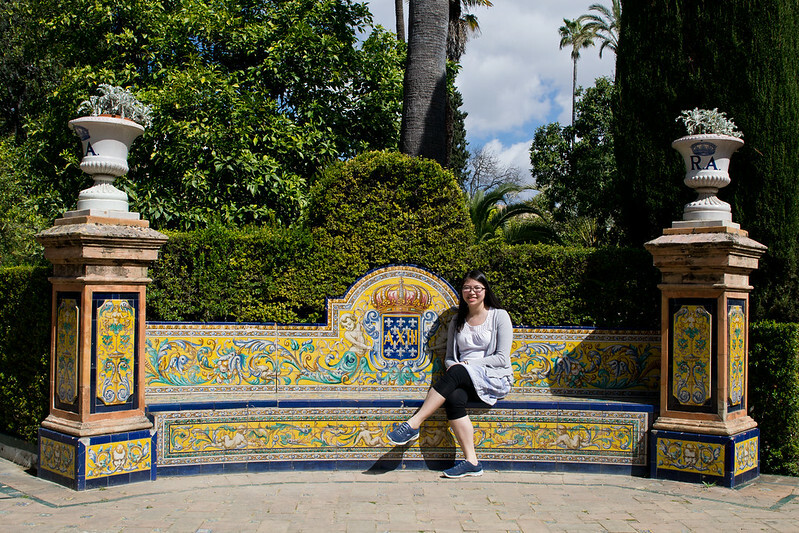 Sevilla is on my list but I’m so intrigued by the history and architecture, I won’t lie.. I’d spend most of my day in the gardens! Never have been here but have always heard great things. Your photos are really convincing me to hop on a plane over!